Behavioral science has a lot to teach us about getting across the finish line — in running, in work, and in life. “I run” is also true, but according to science, framing a hobby as a part of my identity might make me better at it. I apply a certain level of nerdery to every aspect of my hobbies (be forewarned). Not long ago, running a marathon seemed an impossible task — something only “really athletic people” can do. Adopting “runner” as part of my identity was the baby step I needed to get me past the 5K mark. It turns out that behavioral science has a lot more to teach us about getting across the finish line — in running, in work, and in life. From the science of motivation, here are five points to consider in turning your own impossible dream into your next humblebrag. 1. Aim: Choose a thoughtful goal. 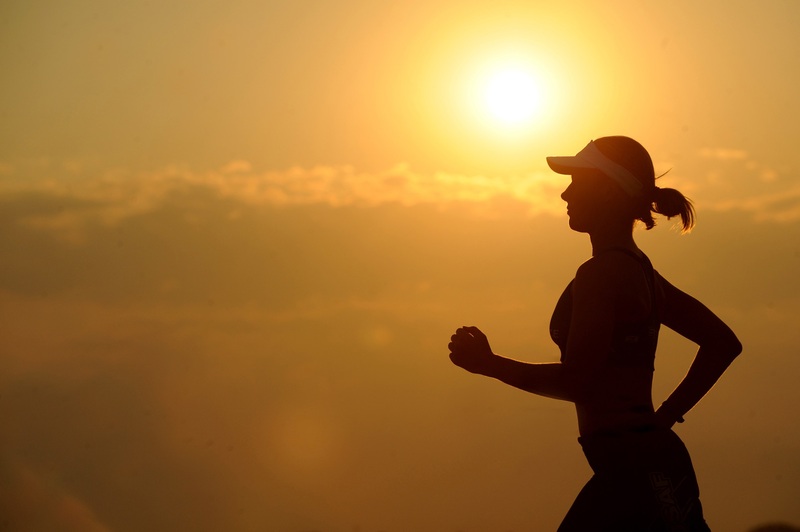 Running is the ultimate hobby for the goal-minded individual. In 2014, The New York Times published a compelling portrait of the power of goals to motivate behavior. Based on an academic analysis of nearly every marathon completed around the world, the seemingly typical bell-curve distribution of finish times actually reveals steep spikes at round numbers, such as the common “four-hour marathon” goal. Runners cluster exactly at, or just under, these arbitrary numbers. Not many folks appear to strain for a precise 4:05:23. Why do so many squeak in just before the perfect four? Because goals matter. We’re wired to find a way to hit our target, even a random one. As the Times article points out, however, “round” is not the most discerning criterion for a goal — particularly not when it comes to financial investments and professional endeavors. When choosing your goal, pick something achievable (truly impossible goals set us up for failure, which is super demotivating), but be honest with yourself. You can probably do more. If you are progressing well and have energy to spare, push yourself with a stretch goal. I never would have made the leap from a half-marathon to a full otherwise. It’s double! But as it turns out, it’s doable. Importantly, consider both “be good” and “get better” goals. It’s important to honor the developmental progress that happens along the way to breaking time records. A running goal of becoming more mindful of my breath, learning to run without headphones, or joining a running group to find motivating pals — those are all get-better goals. They’re just as important to celebrate as achievement-oriented time or distance goals. The same is true at work in recognizing employees for achieving training and educational goals, in addition to their performance outputs. 2. Commitment: Hold yourself accountable. Have you set your goal? Quick, tell someone! Social psychologist Bob Cialdini shows that commitment and consistency are core principles of success. Sharing our goal with others makes us more likely to follow through because we generally dislike contradicting ourselves. Careful, though: Watch out for vicarious goal commitment, the tricky phenomenon whereby merely considering something that’s “good for you” somehow seems to satisfy the goal and allows you to quit before you start. (OK, I got a Runner’s World subscription. I deserve a nap!) You have to actually do the behavior you’ve committed to. Shoes to pavement. Thankfully, behavioral science gives us some hacks to hold ourselves accountable. Precommitment is a helpful tactic to nudge ourselves toward the behaviors we want to do but struggle to, you know, do. There’s an app for this! StickK.com helps us write our own Ulysses contracts — “tying us to the mast” by automatically donating our money to an “anti-charity” we hate if we don’t hit our goal. In my training efforts, I found it more appealing to find accountability in the innate drive to be social. I invited my friends along on my marathon journey by agreeing to meet a pal for a regular early-morning run. Left on my own, I would be tempted to roll back over in my warm bed, but I never had the nerve to leave my buddy hanging out in the cold. In addition to accountability, running partners provide an added feel-good utility of social connection, also a key driver of success in the workplace. In real life, crowd support has a significant effect, as science shows runners run faster when running with others. And encouragement from others is uplifting. The creative signage dotting marathon routes makes me laugh when I want to keel over. A sorority girl was holding my favorite sign reading, “You look soooo skinny in those tights! !” Is this so different from a co-worker cheering you up after a tough sales call? 3. Feedback: Recognize your progress. While you’re straining to complete a long-distance run or working overtime to win a bear of an account, it helps to be strategic with feedback and goal progression. Motivation hacks pull from research on medium maximization, our ingrained tendency to hyperfocus on “points” along the way to the finish line. We can tap into this bias to maximize our progress with minimal pain. For example, Bonezzi’s to-date/to-go feedback principle suggests that when you’re in the first half of your run, you should focus on how far you’ve come. When you’re in the second half, focus on how little you have to go. Focus on the small portion of the curve to make the whole thing more bearable. Just when we’re about to give up, our brains save the day again. Thanks to the goal-gradient theory, we can count on our tendency to accelerate urgency and effort when we’re nearing a goal. It’s amazing how the internal turbo engine kicks in at mile 25. Keep this principle in mind when your work team is plodding through the eleventh hour toward a difficult goal. 4. Don’t skip dessert: Rewards are the best part. When you achieve your goal, it’s important to reward yourself! Rewards feel good by nature, and they serve an important purpose: They help to solidify good behaviors into healthy habits. Consider different types of rewards. Extrinsic rewards: How about those medals? A boom in marathons and fun runs has helped spawn some serious creativity with hardware that would make Flavor Flav jealous. I’m proud of the collection on my wall, and looking at it can sometimes get me out the door on a rainy morning. Similar logic explains the popularity of status-based tangible rewards such as plaques and trophies, which proud employees are known to treasure for decades to extend the memory of a hard-earned success. Intrinsic rewards: You did this. You hit your goal. That achievement is rewarding enough. Established research on self-determination theory posits that the intrinsic reward of mastery is one of the most important drivers of performance. OK, the runner’s high is nice, too. Best of both: Treat yourself to an extrinsic reward aligned with the intrinsic value of your accomplishment. New kicks can be a motivating reminder of what you can do each morning you slip them on. For your teammates at work, try rewarding their good performance with education credits to strengthen their craft. 5. Retrospection: Take it with you, and do it again! It took me about half a year to fully prepare for a marathon. Mentally and physically, it was a long struggle. But when I think back on it, I remember the joy of crossing the finish line, not the wretched agony of miles 20 through 25 and so many repetitive Sunday “long runs” before that. For that, we can thank the peak-end rule, a cognitive bias to overvalue the peak moment and the end of an experience in our memories. In the case of a marathon, the end and the peak moments are most certainly one and the same. Running a marathon, launching a business, hitting a tough sales goal — they all require pain for gain. Thankfully, our brains are biased toward the sweet accomplishment at the end, encouraging us to repeat and build upon our most difficult, yet most rewarding, experiences. Charlotte Blank is chief behavioral officer of Maritz, which helps firms move people through motivation, events, and experiences. Charlotte forges the connection between academic behavioral theory and applied solution practice, and Incentive Magazine named her among 2016’s 25 Most Influential People in the Incentive Industry.